Help your congregation say “yes” to change. Leader: The Reverend Dr. Peter Coutts, Anglican Church of Canada More than ever before, church leadership is about helping congregants choose a new direction – motivating people to want to change. That means effective leaders must understand how human motivation works. 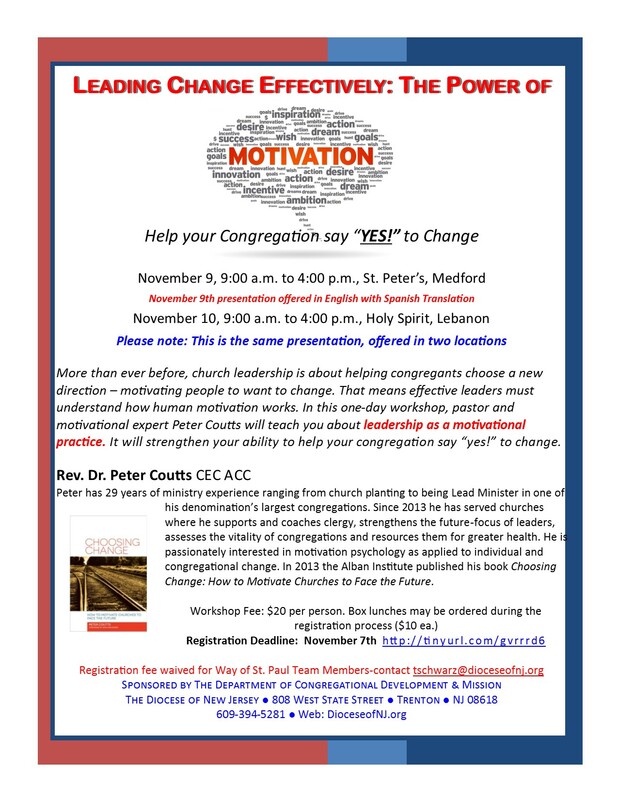 In this one-day workshop, pastor and motivational expert Peter Coutts will teach you about leadership as a motivational practice. It will strengthen your ability to help your congregation say “yes!” to change. Morning Session: An Introduction to Motivation What is—and isn’t— motivation? What are its components? How can Christian leaders use it positively and faithfully to influence people to do new things? The answers to these questions and more will be provided through dialogue, video clips, exercises and presentations. You will be introduced to a straightforward formula for motivation that you can use not only as a leader but also in preaching, teaching, volunteer recruitment and other aspects of ministry. Afternoon Session: Helping People Get On Board with Change Congregational change is like a train crossing over a canyon on a bridge and leaders want everyone on board. 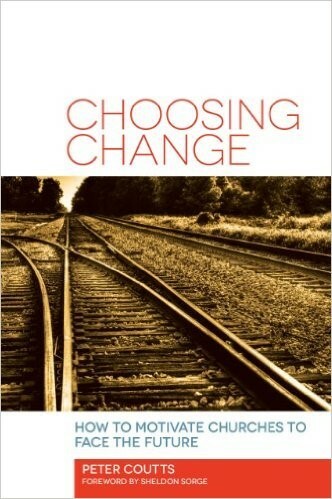 But congregants choose to cross at different times in the change process for different reasons. For leaders this means different people need different kinds of help at different times to get on board with a new congregational direction. We will look at six different kinds of people in your congregation and the influence that helps them choose change. When Wednesday, November 9 or Thursday, November 10 9 am to 4 pm. This is a one-day workshop. The November 10 workshop is a repeat of the day before. Cost $20 per person. Box lunches will be available for an additional $10. Registration Register by Wednesday November 2 online or contact Mary Anne Clisham, 609 394-5281, ext. 10. Contact The Reverend Canon Dr. Rob Droste, 609 394-5281 Ext. 65. Rev. Dr. Peter Coutts, CEC, ACC, has 29 years of ministry experience serving Presbyterian congregations in Canada, ranging from church planting to being Lead Minister in one of his denomination’s largest congregations. Since 2013 he has served southern Alberta Presbyterian churches where he supports and coaches clergy, strengthens the future-focus of leaders, assesses the vitality of congregations and resources them for greater health. 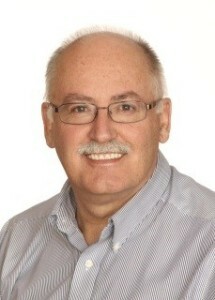 He also has a private practice as a speaker, consultant and executive coach that focuses on leadership development. He earned his D.Min. in congregational revitalization from McCormick Seminary in Chicago, and later went on to teach core courses in that program as an adjunct professor. He is passionately interested in motivation psychology as applied to individual and congregational change. 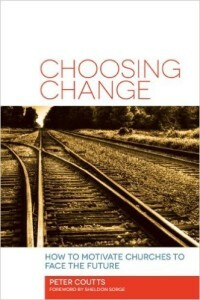 In 2013 the Alban Institute published his book Choosing Change: How to Motivate Churches to Face the Future.